would someday give them rest. We moved to the Fredericksburg / Spotsylvania Virginia area about 10 years ago, and we are surrounded by Civil War Battlefields. In fact, I recently found out that we are actually living on the Chancellorsville Battlefield. (The battlefield encompasses a rather large area of land, and some houses were built on part of it before the National Park Service purchased the rest). Because I am living on a battlefield, I often think about the war, even though I don’t know much about the specific battles. Sometimes—when it is damp, cold, and rainy like today—I look through my kitchen window and imagine young soldiers wandering around out there (a few no older than 10 years old), far from the comfort of home. Tired, wet, and probably feeling lost. There is also a long trench hidden in the woods of our backyard. I think of the soldiers lying there on wet leaves trying to sleep, most likely dealing with spiders, mosquitoes, deer ticks, and an occasional snake. I’m sure that many of them, when no one else was looking, laid there and cried uncontrollably. When good people are born into difficult situations, hard decisions often have to be made. I am sure that all of the soldiers of the American Civil War spent many a dark night wishing they were in their warm beds at home, with a comforting fire burning in the family hearth. But fate, and the unsettled sociopolitical atmosphere of those times, pulled their lives in a different direction. Both sides courageously did the best that they could. 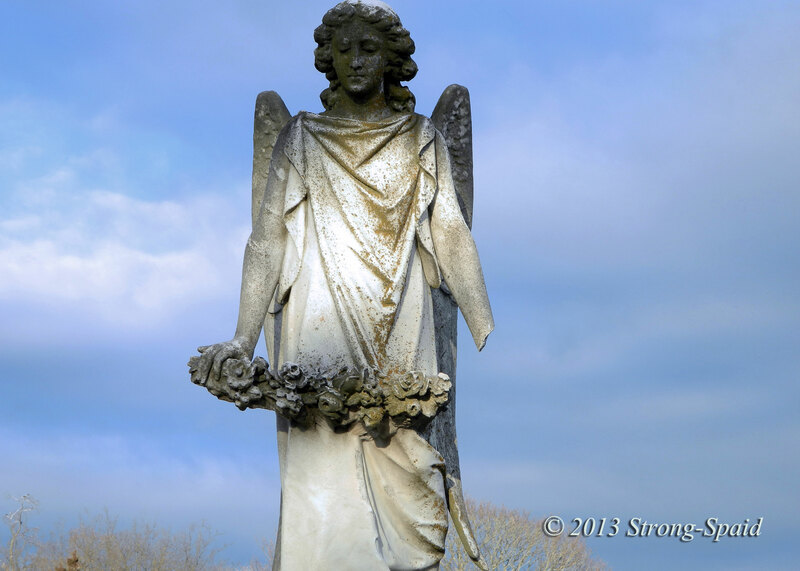 This entry was posted in Civil War, photography, Poetry and tagged Cemetery, Death, Ghosts, Graveyard, History. Bookmark the permalink. That was very well written, and very moving! Mary, this is so beautiful! 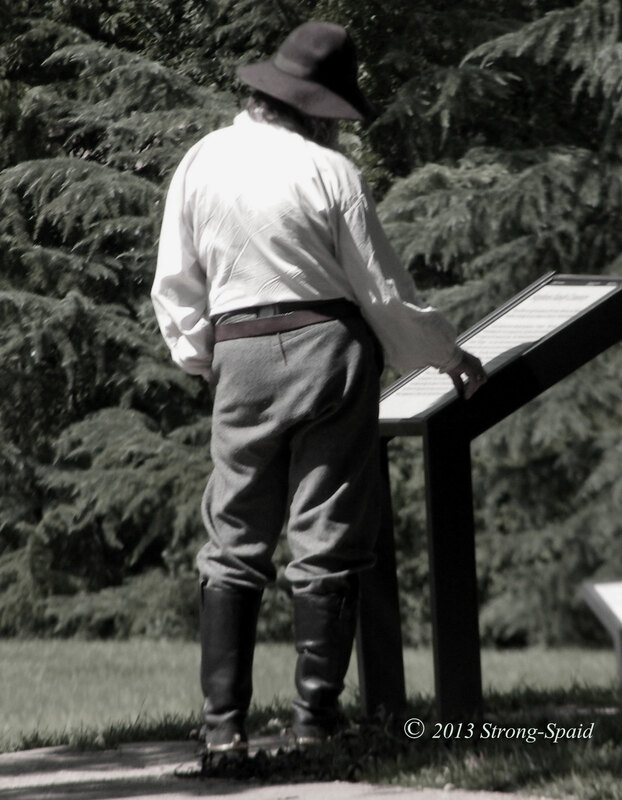 My husband is a huge Civil War buff…he will love this! Thanks Jennifer. I thought I was “surrounded” by the Chancellorsville Civil War battlefield until I went to the Visitor Center (about 2 miles from here). When I told the tour guide where I lived she said, “OH….You are one of those people who live ON The battlefield. Yep. Seems that I am actually “in” the Civil War. Apparently, a few houses were built before all of the land around here was set aside and became a National Park (that’s why I have so many pictures of deer). People say that I should not be surprised if the ghost of Stonewall Jackson comes to my door one night looking for his arm…. Enjoyed reading this. 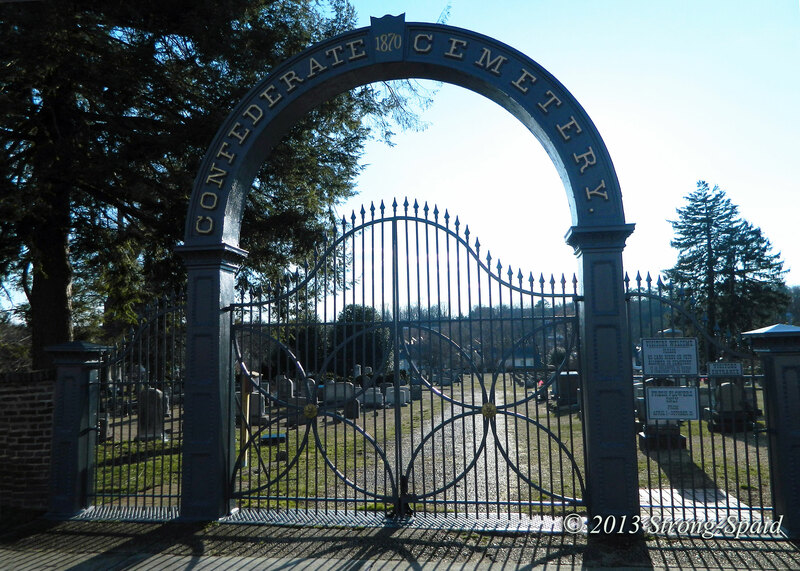 There was a Confederate cemetary right across the street from my brother’s house in Alton, IL. 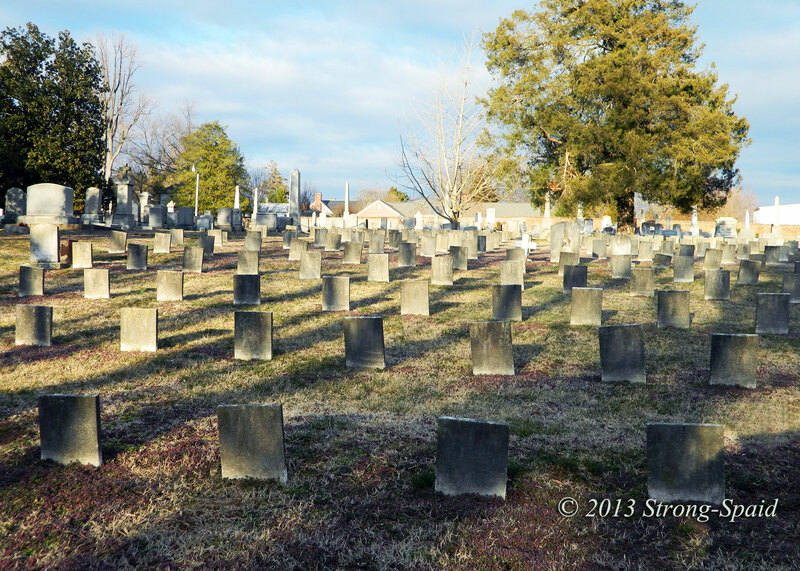 The Union cemetery in downtown Fredericksburg is very large and well-maintained, because it is part of the National Park Service. On the other hand, this Confederate cemetery is rather unkempt and overgrown because it is not part of the National Park Service (or so I am told). As a result it is more “hauntingly” beautiful, with dead limbs on the ground and a few headstones broken and fallen over. Nature seems to have had the final say here. 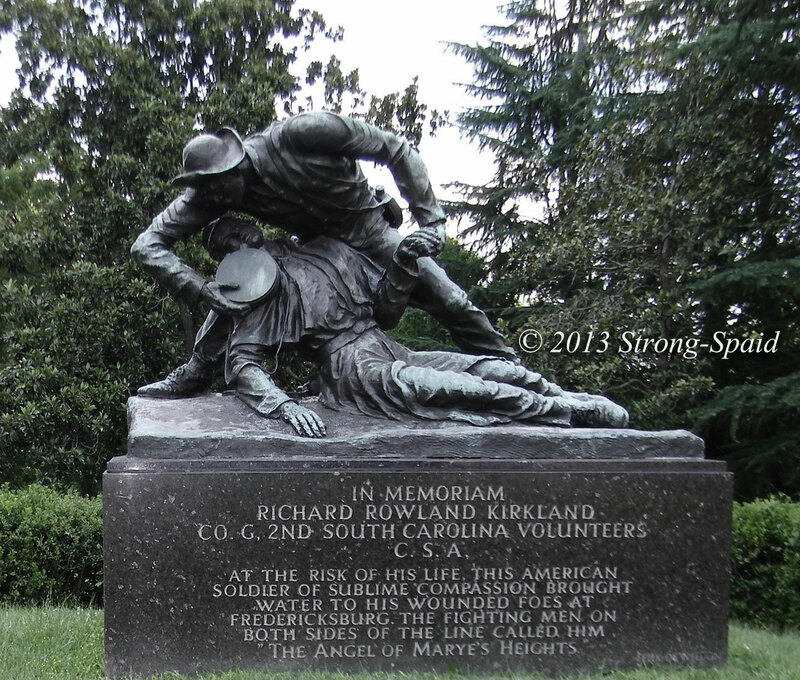 I visited Fredericksburg when I went to North Carolina to visit my friend Paul in 2011. I will write about it when I will post something more on my blog. Thanks! Fredericksburg Virginia has many Civil War battlefields, but I am not as familiar with the war as the people who grew up in this area. Excellent photos and poetry, unfortunately war is a horrid act of man. Within all things, there is good and bad. If history is not remembered, the same mistakes are often repeated again and again. By examining history and remembering the circumstances that led to war, we learn. And if we take the time to learn from past mistakes, we may be able to avert wars in the future. We may be able to keep more young lives from being lost prematurely. There is sadness in this post. It does not glorify war. I have written you a reply twice, in depth. Both times it has disappeared from WordPress as I was finishing. Perhaps I should just say that my comment was thoughtless and that I apologize for not taking a moment’s time to think. The comment did not refer to your poetry nor your photos, just a non-specific statement that served no purpose here. Perhaps I should have written an epilogue under the poem and the photos—to explain. I think that is what I will do. Thank you for giving me the idea. Such an honoring post – thank you for the great photos and beautiful words! Thank you, Southern Sea Muse. I read your post about allergies. So glad you are OK! Evocative – in words and images. Hard to imagine these American boys so young….at war with each other. I can relate to how you imagine the soldiers in the trench and battle fields next to your home. There are places so steeped in history that is almost impossible not to ‘see’ the past in them. I also lived next to Pearl Harbor (in military housing) when I was in Hawaii. So close….it is impossible not to think of things that happened in the past. 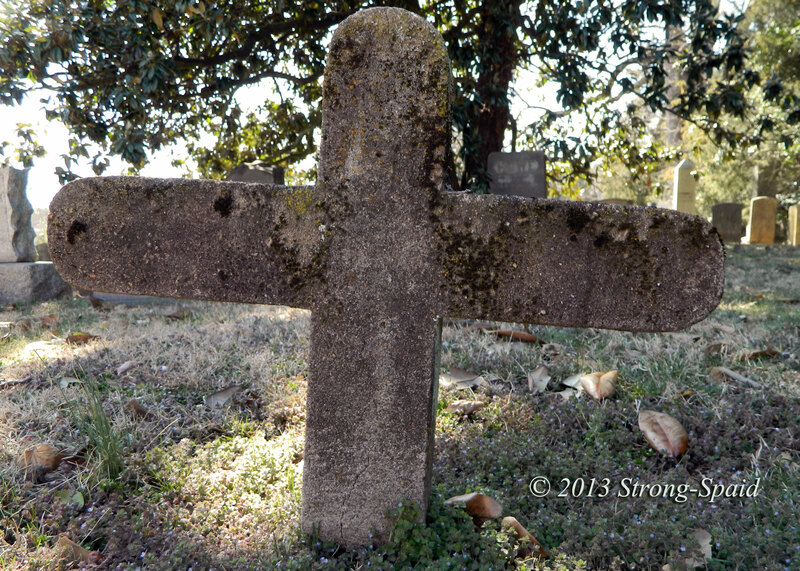 I love visiting Civil War sites and their associated graveyards. We had an incredible visual experience at Gettysburg once. I’ve never been to the battlefields in your area, but some day I hope to! There are a lot of battlefields here. I went to Gettysburg many years ago. It was quite moving. A post on the blog of a blogger who posted a comment on one of my posts about the Civil War. Thanks for your comment on my blog Our Ancestors. I thank you, Pierre….for sharing your photos and memories. Theo is 92. He suffers from Alzheimer. His son-in-law, Rich Cooper, is sending me a lot of documents and pictures. Theo is enjoying the blog. This blog all started with this post. We are barely a month shy of the 150th anniversary of the Battle of Chancellorsville, one of the key clashes of the Civil War. At the Chancellorsville Visitor Center, Mary Stong-Spaid discovered her home is actually on the battlefield. 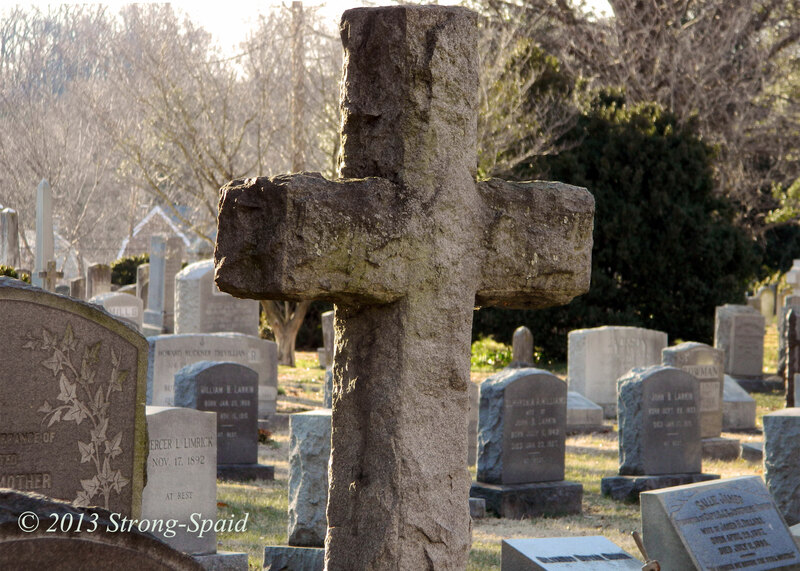 Earlier this month, she offered these moving reflections and photographs of Civil War graves and monuments. Thank you for re-blogging, Morgan. Do you live in Virginia too? Hello Mary – I found your post in the re-blog on Morgan Mussel’s site. Glad to find your blog. My g-grandfather was in both Fredericksburg and Chancellorsville battles (an Irish immigrant fighting on the Union side). You might want to take a look at Ken Burns’ fine PBS documentary on the Civil War. It will give you some background on your backyard! Great….I will see if I can find Ken Burn’s documentary. Does your family still live in this area? If you do, you might like to come to the Rappahannock Chorale Society Civil War music concert in May. Marvelous Shots. We have a small private civil war era cemetery here on the farm where vets of the North Carolina Infantry and their spouses are buried. I’m familiar with the Fredericksburg / Spotsylvania Area having worked in broadcast news in Richmond for many years. Thanks for the follow. What a fascinating place to live. It is very interesting to think about. All the things that are around here now (Subway, Starbucks, 7-Eleven, Giant Food, Home Depot, Burger King, the Spotsylvania mall–etc., etc. etc. ), were certainly not around back then. The soldiers had no place to quickly grab a hot sandwich and a drink. Probably took most of their baths in the Rappahannock river or the pouring rain. Couldn’t send a text message to a buddy, email a friend, or call home to mom. Couldn’t jump on Facebook to see how their friends were doing. The young men (many young boys) of the Civil War were totally out on their own–trying to deal with the environment, the “enemy”, and themselves. They had to grow up fast. Very moving and beautiful. 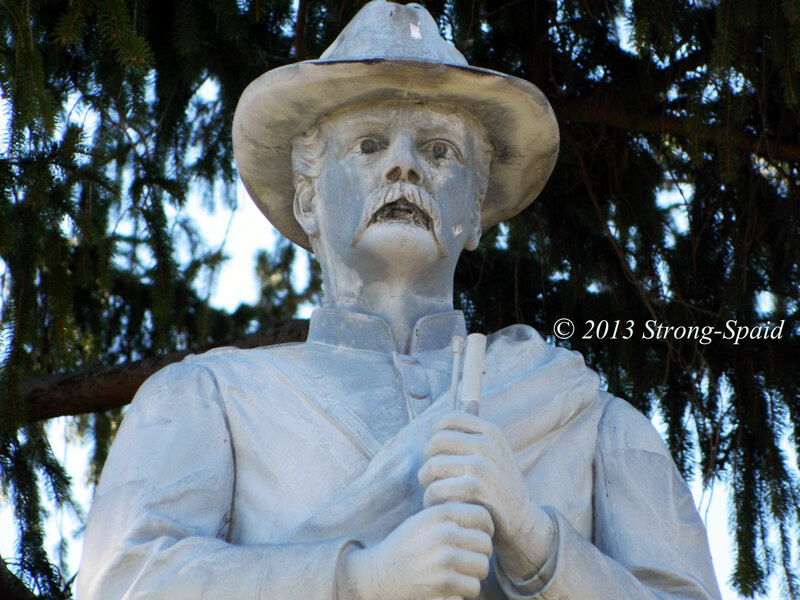 We live near Gettysburg and have traveled to other Civil War sights and often the Confederate Soldiers seem to be forgotten – that was a lovely tribute to their bravery. When we first bought this house, I knew we were surrounded by the Chancellorsville Battlefield. I eventually found out that the reason we are surrounded by the battlefield, is because we are actually in it. Which kind of explains why I kept seeing the shadow of a man playing a piano (in the living room)—while this house was being built. That is an interesting story. It looks like you are happy too! Great post and how incredible to be living in such an interesting location. I have been lucky enough to visit some of the WW1 battlefields where my great grandfather fought and died. I have also visited a lot of the Normandy sites and am always struck with how quiet and peaceful they now seem. Yet not too long ago they were filled with noise, smoke, fear, heroism, tears, bravery and so many other emotions. I always feel in awe at these hidden scenes and have the utmost respect for what were ordinary people doing extraordinary things. I would love to come over some time and see some of the civil war sites. I agree. Standing here—feeling the warm sunlight and soft breezes, and the birds singing in the trees–and then remembering that this same place was once a battlefield,with gunshots, fear, sadness, and death. Now It is almost hard to believe that all that happened then. Sometimes in my thoughts I see young soldiers leaning up against the oak trees and sitting in the leaves, completely exhausted. Wishing the war would end; wishing they could go home again.